High school bullies were throwing trash at sophomore Chy Johnson, calling her "stupid" and pushing her in the halls. Although Chy is a sophomore in high school, because of a genetic birth defect her brain works at only a third-grade level, but that certainly doesn't mean she couldn't feel the pain from being bullied. Chy's mom says that she tried to talk to teachers and administrators and didn't get anywhere. She knew she had to do something to protect her baby so Chy's mom, Liz, reached out to a "friend" who had escorted Chy to the Special Olympics and happened to be one of the most popular kids in school. 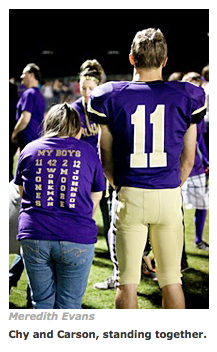 Liz Facebooked the starting quarterback of the undefeated football team, senior Carson Jones. Liz asked Carson to "Just keep your ear to the ground." and to, "Maybe get me some names?" on his Facebook page. 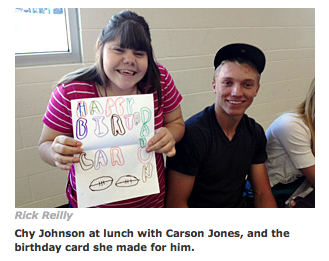 But Carson Jones has a heart of gold and he had a different plan. Instead of ratting other kids, which he knew could create even more problems for Chy, he decided to make her one of the "cool" kids. Carson started asking Chy to eat at the cool kids' lunch table with him and his teammates. "I just thought that if they saw her with us every day, maybe they'd start treating her better," Carson says. "Telling on kids would've just caused more problems." Instead of causing more problems, Carson set an example of human kindness that was replicated throughout by his teammates. Starting running back Tucker Workman made sure somebody was walking between classes with Chy. In classes, cornerback Colton Moore made sure she sat in the row right behind the team. And the best thing is? The football players didn't tell anybody about their plan. "Are you kidding me? Why didn't you tell me this?'" All of a sudden, Chy started coming home as her bubbly self again and when her mom asked why she was so happy, she said, "I'm eating lunch with my boys!" The boys take care of Chy, and she takes care of the boys. Carson, who has a GPA of 4.4, got in a car accident last week and since then, Chy is always trying to carry his backpack. "I know his neck hurts," she says.